Starring Deborah Kerr and Stewart Granger is one of our favourite films of the 50s. Worthy of its Oscar nomination for Best Picture, we think the striking four-colour artwork on the UK Quad is equally worthy of an award itself. A very rare, very beautiful poster in fabulous condition for its age. Small tear on fold margin. Writing on back, no bleed-through. Light wear and staining on cross folds. For further details or information on backing or framing of this poster please see our website Orson & Welles. 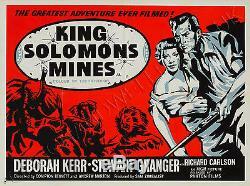 The item "Original King Solomon's Mines 1950, UK Quad, Film/Movie Poster" is in sale since Wednesday, April 23, 2014. This item is in the category "DVDs, Films & TV\Film Memorabilia\Posters\Originals - UK Quads\1970s". The seller is "orsonandwelles" and is located in Bath.